Following their crash on the second lap of Saturday’s Sidecar TT race Ben Birchall is being transferred to Wigan where he will see a hand specialist to assess the damage to his right hand. The race had been going extremely well for the Mansfield brothers and they looked certain winners if they had continued. They had stretched out a lead on time of over four seconds at the end of lap one and were reeling in Dave Molyneux on the road at a fast rate of knots. By the time they reached Greeba on lap two they had passed Moly but a few seconds later Moly was back in front. 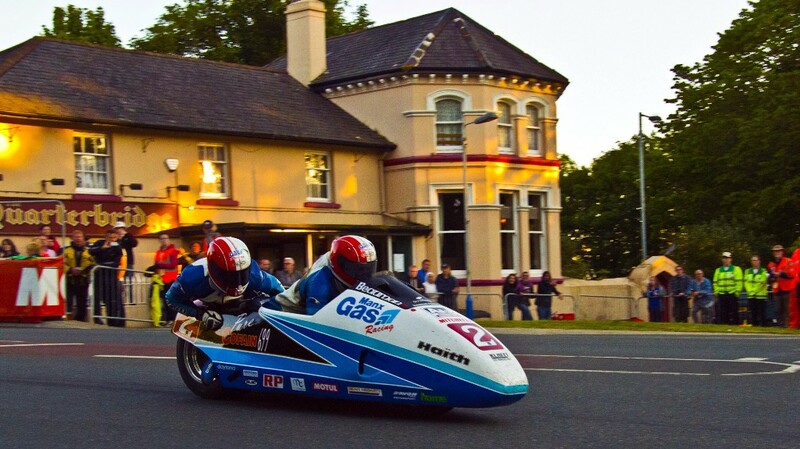 But as the riders set off at 10 second intervals the Birchalls would have been at least eight seconds ahead on time. But it all went wrong at the Black Dub section of the course when they clipped a wall, the outfit spun and shot across hitting the wall the other side of the track which caught Ben’s hand causing the injury. He has an open wound across the back of the hand and also some bone damage. Luckily Tom is ok. He has a lot of bruising but no broken bones. The pair were airlifted to Nobles Hospital in Douglas for further assessment and Ben has had two operations on his hand to clean the wound and sort out some of the bone damage. The x-rays were sent over to the specialist in Wigan and Ben is to be transferred there today for further treatment. Tom has been released from hospital and will remain on the island until the end of TT week. He commented: “The specialist is top notch and was the guy who sorted out John McGuinness’ injury a while back so Ben is in good hands. Once he has been treated in Wigan he will spend some time in the hyperbaric chamber to speed up the healing process. “We have a World championship race in Croatia in just over two week’s time and if all goes to plan we will be on the grid to defend our series lead.